High quality coffee and vanilla flavour in a delicious instant latte. A coffee shop-style drink crafted by experts. Made with fresh milk sourced from British dairy farmers. Crafted using a blend of natural high quality beans. 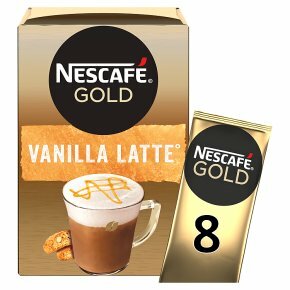 Create delicious vanilla lattes at any time with 8 latte sachets.Enjoy true expertise in every sip of your smooth and flavourful NESCAFÉ GOLD Vanilla Latte. Savour each moment with a high quality, flavourful coffee that you can enjoy at any time.